William Joseph Ernest Gleed was the first of the seven children born in Frampton to Ernest William Gleed and Mary née Brown, one of whom, Ivor, died in infancy. William was baptised on Christmas Day 1894 at St Mary's. Home was the property now known as The Old Bakery (at the north end of The Street), from where Ernest ran his business. By 1911 William had become a postman. He enlisted at Gloucester on 18 June 1915 (the same day as William James George Daw) into the Army Service Corps. 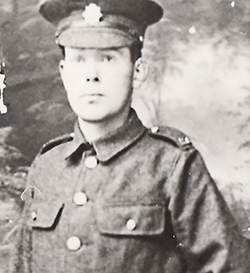 A baker by trade, on 13 July he was posted to 40 Field Bakery, part of the 53rd (Welsh) Division, being deployed with them to the Mediterranean theatre and landing at Suvla Bay, Gallipoli, on 3 August. He became ill in late September and was evacuated first to hospital (probably a hospital ship), and then to the UK where he arrived on 27 October. Owing to losses in action, casualties from illness and a November blizzard, the entire Division was reduced to about 15 per cent of its effective strength and in December was withdrawn to Egypt. Members of William's family recall that a Christmas cake was dispatched to him at Gallipoli, but it missed him and in due course followed him to France, where he arrived on 20 March 1916 to serve with 9 Field Bakery. He stayed for nearly a year. In March 1917 he appears to have suffered medical problems, recorded as heart disease, and was repatriated for discharge as no longer physically fit for war service. At discharge a month later he was described as 'A good baker, honest, sober and reliable', and received a disability pension for 20 weeks, together with the Silver War Badge. He was later awarded the 1914-15 Star, British War Medal and Victory Medal and his service is commemorated on the plaque in the village hall alongside that of his brother Harold James Frederick. On 2 July 1917 William, then a clerk, married Constance Rose Robins at St Andrew's, Alvington. They settled into married life at Redmarley, where they may have run a Post Office, and had three children: Constance Mary, Grantley William and Robin Harold. In 1943 William bought Ward's Court in Frampton, which was then called The Nurseries. William Joseph Ernest Gleed died in Frampton and was buried in St Mary's churchyard on 18 October 1963.